Did you know that you can order from my Stampin Up! online shop if you live in the UK, France, Germany, Austria or the Netherlands and have the order delivered to your door? In a nutshell, if you join Stampin’ Up! between now and the 31st March 2018, you can choose the usual £130 worth of products from any of the current catalogues AND add the two highest priced wooden stamp sets (which have a total value of £90) to your order and get them FREE!! A superb deal to get you a whole lot of product (up to £220 worth) for less than half that cost – just £99! 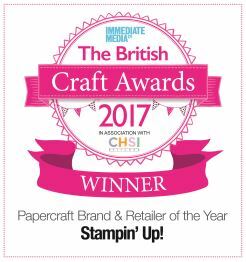 I’d be delighted to help you choose your products or answer any questions you have about the offer, or anything else you want to know about Stampin’ Up! so please use the Contact tab at the top of the page and I’ll get back to you as fast as I can. Just click on the photos of the catalogues to see what’s inside – get yourself a coffee and enjoy………. Happy New Year to everyone! I hope you all had a lovely Christmas and enjoyed bringing the New Year in last night too! There’s only 1 day left to shop for the discounted and retiring products in the Year End Sales Event BUT there’s also just over 1 day to wait until the new Spring/Summer Catalogue is available and Sale-A-Bration begins on 3rd January 2018! This is an annual event where you can choose a free product from the Sale-A-Bration catalogue for every £45 you spend on items from the normal Annual Catalogue or the Spring/Summer Catalogue. Check back on 3rd January to see the new catalogues once they’re live. If you’re already a customer of mine, copies will be winging their way to you shortly – enjoy! PLEASE NOTE THERE IS A NEW HOSTESS CODE FOR JANUARY 2018 – YSDTERAV – PLEASE USE THIS IF YOU ORDER ONLINE AND YOUR ORDER IS UNDER £150. THANK YOU. Another surprise from Stampin’ Up! Happens on Monday 11th December!!!!!!! Started yesterday, but my laptop was playing up a bit and wouldn’t let me tell you all about this! So if you’re looking for some savings on Stampin’ Up! goodies just click on the picture above and it’ll take you to my online SHOP. Once you’re there, just click on the same banner at the top, or look for Year End Sales Event in the column on the left of the page. Enjoy! The first incredible offer is a 24-HOUR STAMP SALE offering 20% off selected stamp sets. This Stamp Sale takes place on 20 November between midnight (CET) and 23:59 (CET) or 19 November 23:00 (GMT) to 20 November 22:59 (GMT). Further discounts of up to 40% are available on other selected products from this time too – but they’re available (subject to availability) until 26 November at 23:59 (CET). Click HERE for the details of all the stamp sets in the 24-hour sale, as well as the other discounted products you can order between 20th and 26th November. You can reserve the brand new Stamparatus NOW!!!!! Limited quanties are available in each reservation window, so don’t leave it too late – you can always change your mind later! The first shipment can be ordered from now until 30 November 2017 – with expected delivery around 01 February 2018. It’s £44 – but you don’t pay when you reserve it. When the product arrives at the warehouse you’re reservation will be added to a shopping cart and you’ll be emailed to let you know that the order is ready to be finalised and paid for. The second reservation period is 5 – 30 December, with delivery expected around 19 March 2018. The third reservation period is 15 – 30 January 2018, with delivery expected around 15 April 2018. Customers can only reserve 1 Stamparatus per reservation window. To reserve your Stamparatus: just click the Stamparatus Reservation picture once you are on my SHOP page – EASY! Will update this page within the next couple of days with more information – it’s exciting stuff! New products, discounts, freebies!!! !